Who can come to our contra dances? Everyone! Our dances are attended by people of all ages, genders, races, backgrounds, experience levels, and fitness levels. What should I expect when I come to a Friday night dance in Pittsburgh? An introductory pre-dance lesson is offered at 7:30 pm. Throughout the evening, each dance is taught in a 5-minute walk-through before the music kicks in. The caller continues to prompt the moves. You do not need to know any of the figures before you arrive. Between 8 and 11 pm, there will be around a dozen different dances: mostly contras (traditional through brand new), sometimes squares and circles, and always a couple of waltzes. To be sociable, expect to dance with a different partner for each 10-minute dance. Anyone can ask anyone else to dance. We encourage newcomers to dance with experienced dancers. You will learn quickly and have more fun that way. Complementary refreshments are served about halfway through the evening. There is no particular dress code for our dances. We suggest comfortable clothes that you can move in easily. 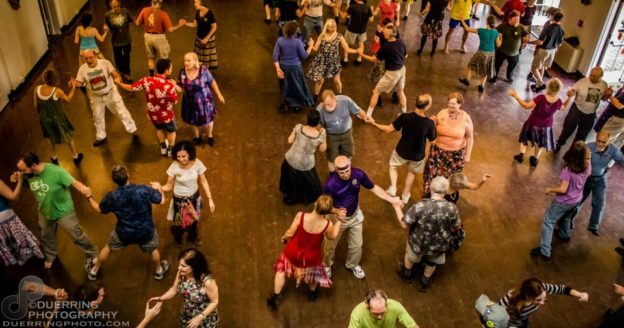 Contra dance is aerobic, and you will likely work up a sweat. Many people wear flowing skirts or kilts, but jeans and a t-shirt are also common. We ask that you bring clean, non-marking shoes to dance in. The best shoes are those that you can move in easily. Many people wear purpose-made dance sneakers or shoes, but they are not necessary. Shoes with a medium level of traction are best (athletic sneakers can stick to the floor and make it hard to move freely). No, you do not need to come with a partner. We switch partners between each dance. Whether you come alone or with friends, you will meet lots of new people at our dances. But I still have no idea what this contra dancing thing is all about! Come to a dance and find out. If you want a preview, there are thousands of videos available if you search for “contra dance” on YouTube. A couple very nice summary videos and another person’s attempt to describe contra dancing are available here. I am not obligated to dance with anyone. I can turn down any dance for any reason. I can end any dance early for any reason. My boundaries may be different with different people. I can discover new boundaries I didn’t know I had. I can tell my partner that they’ve crossed a boundary. I am not entitled to dance with anyone. I will not take being turned down as a personal insult. I will treat every dance I receive with respect. I will apologize if I cross a boundary. I will not belittle or deny my partner’s experience. I will ask consent for anything I think may cross a boundary.